London - Usain Bolt made history on Thursday when the Jamaican successfully defended his Olympic 200m crown to claim an unprecedented second successive sprint double. Bolt, who retained his 100m title on Saturday, crossed the line in the equal fourth fastest time of all time of 19.32sec to win in front of a delirious sell-out 80 000 crowd at the Olympic Stadium. The 25-year-old's victory meant he bettered the record of US track legend Carl Lewis, who won three golds and a silver in the sprints at the 1984 and 1988 Games. Bolt said: "This is the one I wanted and I got it." It was also the first time two individual track titles were successfully defended at successive Games since Finland's Lasse Viren won the 5000m and 10 000m in the Munich and Montreal Games in 1972 and 1976. Bolt led a Jamaican clean sweep of the podium, with training partner Yohan Blake taking silver in 19.44sec and Warren Weir claiming a shock bronze in 19.84sec. The only thing missing from the race was a new world record for Bolt, but he revealed he had felt his back during the race. "I could feel the straion on my back a little bit so all I did was try to keep my form, run home and when I saw where I was going I stopped running because I knew it wasn't going to be a world record." 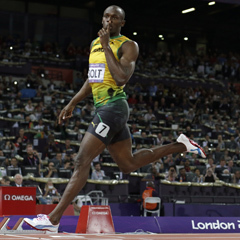 Running in lane seven, Bolt was up on Weir outside him within five paces after an explosive start. As he rounded the bend, Blake briefly threatened from lane four, but teeth clenched, eyes on the big screen and at full tilt, Bolt had enough to slow down a full 10m from the line, raising his finger to his lips as he did so. Whether that gesture was for title contender Blake or this season's growing band of doubters, only Bolt knows, but his victory underlined his position as the greatest sprinter on the planet. The London Games are Bolt's fourth global championship since 2008. He has won six titles in the seven individual events in which he has competed, his one blip coming when he was disqualifed from the Daegu world championship 100m final last year after a false start. Bolt, also the world record holder in both the 100 and 200m, was not quite his usual playful self in the moments before he settled, an air of seriousness permeating a silenced stadium as he offered a regal-like wave. Amid the tangible tension, Bolt briefly crossed himself and pointed skywards before setting himself. The starter's gun signalled a dramatic change in mood as a determined Bolt pulled out all the stops to burn off his rivals from the off. Apart from Bolt, eight men (Archie Hahn (1904), Ralph Craig (1912), Percy Williams (1928), Eddie Tolan (1932), Jesse Owens (1936), Bobby Morrow (1956), Valeriy Borzov (1972), Carl Lewis (1984), have won the sprint double at the same Olympics, but only Hahn and Lewis have successfully defended the short sprint. Hahn missed out on his chance of a "double-double" when the 200m was not included in the 1906 Games and Lewis, after being upgraded to 100m champion in Seoul following Ben Johnson's disqualification, lost to US team-mate Joe DeLoach in the 200m. South Africa's Anaso Jobodwana finished last in the race after a time of 20.69.